The first quarter of 2016 saw a continuation of the impressive performance seen in the past two years with most key economic indicators registering steady growth. Most importantly, personal consumption is now seeing sustained growth, up 3.5% year-on-year for 2015 demonstrating a consumer economy that is now firmly in recovery. The KBC/ESRI consumer sentiment index hit a fifteen year high of 108.6 in January 2016. By March, however, Irish consumer sentiment had weakened significantly with the index falling to a six-month low of 100.6. This drop has been linked to prolonged political uncertainty following February’s inconclusive general election, as well as the imminent Brexit vote in the UK. Nevertheless, the three-month moving average remained strong at 105.0 in March 2016, representing an annual increase of 6.8%. Irish retail sales are seeing steady growth in 2016 with the latest CSO figures showing sales volumes to have increased by 5.2% in the year to March 2016. When motor trades are excluded, sales volumes are up 6.4% annually to reach a level not seen since 2007. 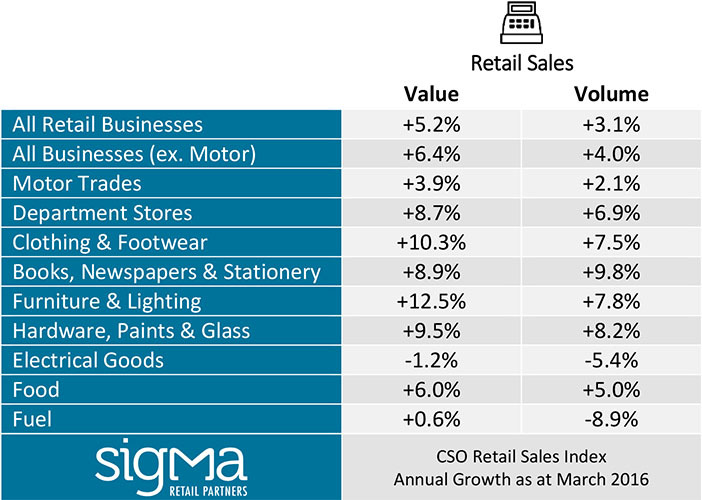 Sales volumes do not tell the full story however, and price discounting has meant that the total value of retail sales has seen slightly slower growth, up 3.1% annually during this period, or 4.0% excluding motor trades. The strongest performing sectors in the year to March 2016 (in volume terms) were furniture & lighting (+12.5%); clothing, footwear and textiles (+10.3%) and books, newspapers and stationery (+8.9%). The Visa Europe Consumer Spending Index shows that there has been no slowdown in household expenditure in the first quarter of 2016, registering a year-on-year increase of 5.6% across all payments in March. This compares with slower growth in the UK, where spending is up 2.3% for the same period. Irish high street retailers are seeing an increased willingness among consumers to spend on discretionary items, leading to a 3.8% annual rise in face-to-face expenditure, while online spending continued to see a sharper expansion, up 9.5% year-on-year.